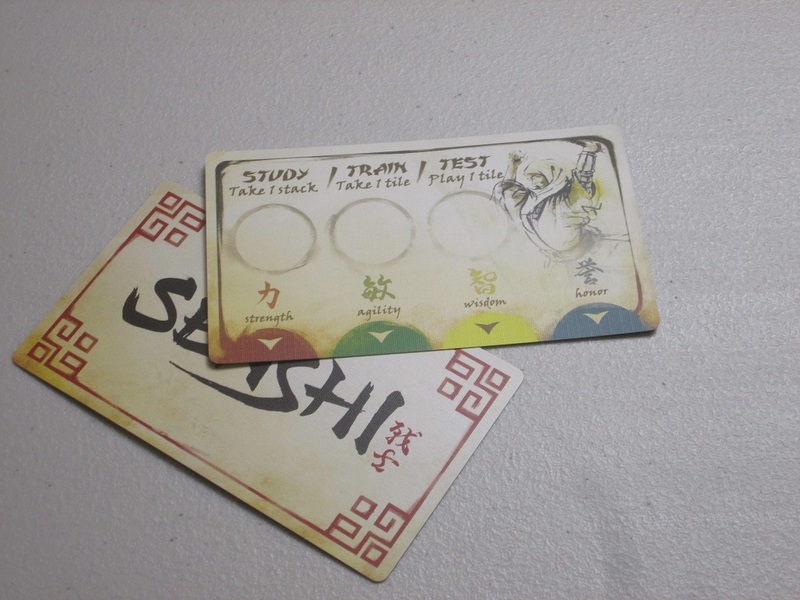 Senshi is an abstract game for two to four players. Players are warrior monks trying to be chosen as the dying master’s successor. The player with the highest stack of chips (who also wasn’t eliminated) is the winner. Senshi set up for two players. To begin, each player receives a tableau card. The chips are shuffled on the table and placed into stacks of three. A start player is chosen, and beginning with that player, each player chooses one stack of chips to place concealed in their hands. Play begins. 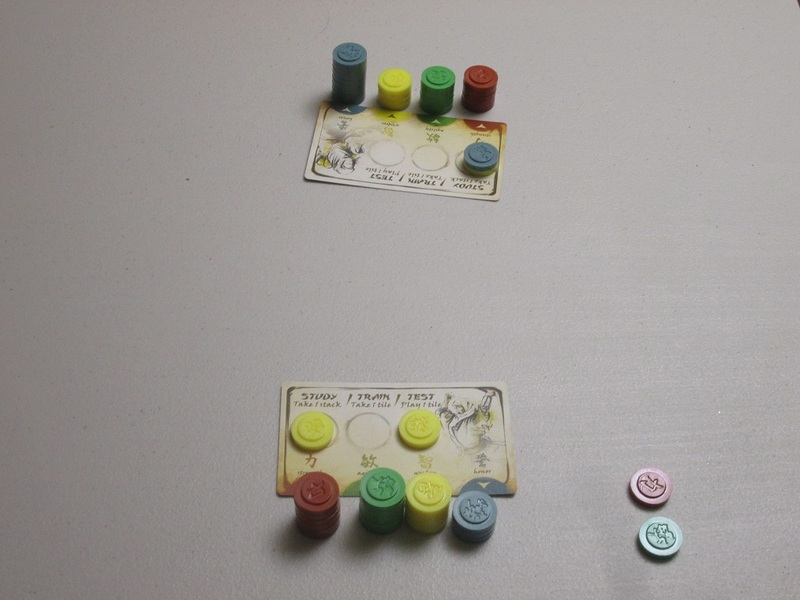 The game ends when the last stack has been placed on a tableau. Each player (including the player who chose the stack) gets one final turn. Then, the player(s) with the smallest stack is eliminated from the game. Of the uneliminated players, the player with the tallest stack is the winner. Elegance is something I praise in board games. I love when I can explain a game using just a few sentences, when I’m not constantly answering rules questions, when players can disappear into the flow of a game and not constantly be worrying about whether they’re playing correctly. Senshi is a game whose design clearly prizes elegance. Each turn players choose one action from among three, and a turn is finished in seconds. The fifteen-minute playtime promised on the side of the box is high, if anything. Yet elegance isn’t everything, and it’s possible for elegance to be carried too far, for sharp edges to be so scrubbed away that you lose the kernel of the good idea that sparked the game in the first place. To me, Senshi falls into this camp. It’s simple, it’s quick, it’s elegant…and it’s almost completely unremarkable. The theme of Senshi explained in the flavor text. 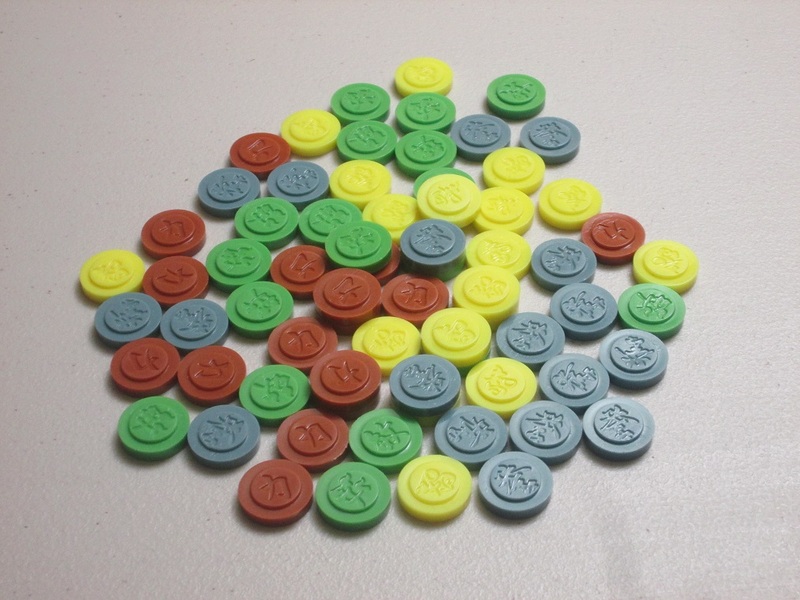 In practice, though, it’s really about colored chips in stacks making their way to your card. Notice that in what I said, I didn’t say Senshi is bad. It’s not a bad game by any stretch. It functions. Player choices matter. There are rules that work, and there are winners and losers. The scoring system–which feels torn from Reiner Knizia’s playbook–is interesting, as far as it goes. Yet at the end of a game, it’s hard to feel good or bad about a win or a loss. In fact, it’s hard to feel much of anything about Senshi. This failure to feel begins with the packaging and components. The slight artwork on the cover and the box and the pale, parchment browns that decorate it are illustrative here of what’s inside. 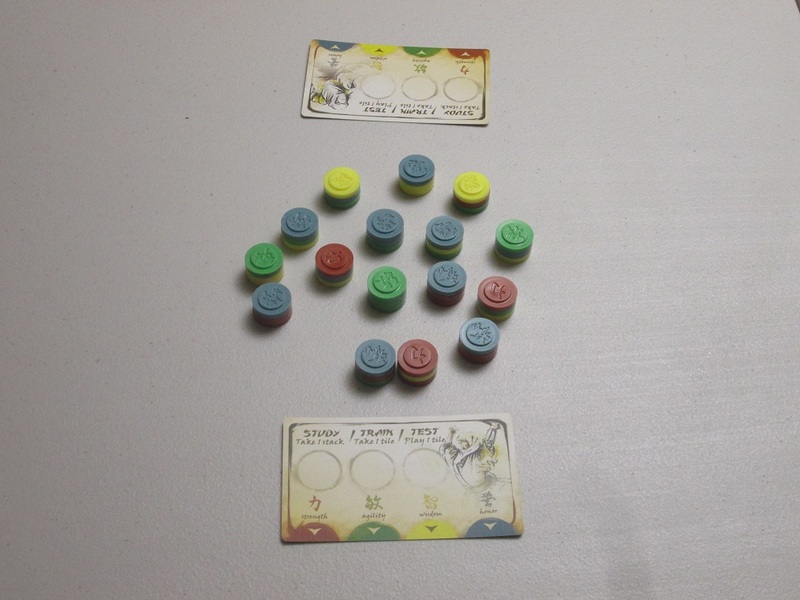 The components are a card for each player–again, slightly illustrated and lightly colored–and colored discs that, while each bears a different Japanese character, are otherwise nondescript. Don’t get me wrong: the components, such as they are, are good quality, but they fail to situate the game in a distinct time and place or to give much of a backdrop to what players are supposed to be doing. The card tableaus for players. These include a handy aid for the game’s simple rules. Which isn’t a deal breaker: not every game needs a full story to be enjoyable. I recently reviewed Azul, an abstract game I really enjoy, which similarly has very little in the narrative department. But in order to stand out as an abstract–if you aren’t walking the path of lavish components–the game has to offer good decisions, decisions that make a difference. Senshi isn’t necessarily lacking decision points. I would say the game is more about tactics than luck. It’s just that most decisions, while they matter, don’t feel weighty. Which stack do you take? Well, all the stacks have three tiles from four colors; many of them are the same or similar enough that it probably doesn’t much matter which you choose. Which tile do you take into your hand? Well, you need a red, so you grab a red tile from the place where it makes the most sense–maybe from an opponent or from the main stacks, as opportunity dictates. Which tile do you score and when? 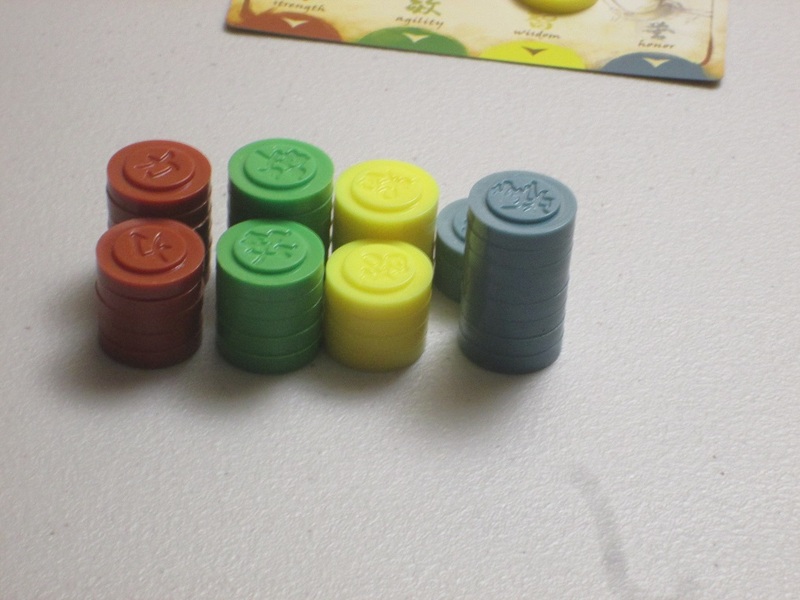 This can be a little tricky, and is the most interesting decision in the game–you want to specialize to win (tallest stack), but you need to diversify to not lose–but it’s still not a decision that you feel especially clever making. The discs in Senshi. These are good quality, but they don’t evoke the traits the rules say they represent in any way. I think that’s what it comes down to: it’s difficult to evaluate whether one decision is truly better than another, and the game is short enough that the game doesn’t have time to provide feedback to players, good or bad, on the decisions they’ve made. Further, decisions are so slight and tactical that it’s difficult to feel ownership over them, to make a bold mark on the gaming landscape and say, “This was my decision, I made it for these reasons, and look how handsomely it has paid off!” (Or “see how spectacularly it has failed!”) In Senshi, you make several light decisions, the game ends, and you evaluate the winner. The end of the game. The player on top won. Again, I don’t mean to say that the game is all luck; it isn’t. It’s also not “bad” in the sense that I actively dislike it or it doesn’t function. It’s just, again, unremarkable. On paper, this should be an interesting game: quick turns, one action per turn, and you need balance to prevail. Lots of the best hobby board games in recent memory have employed these traits. 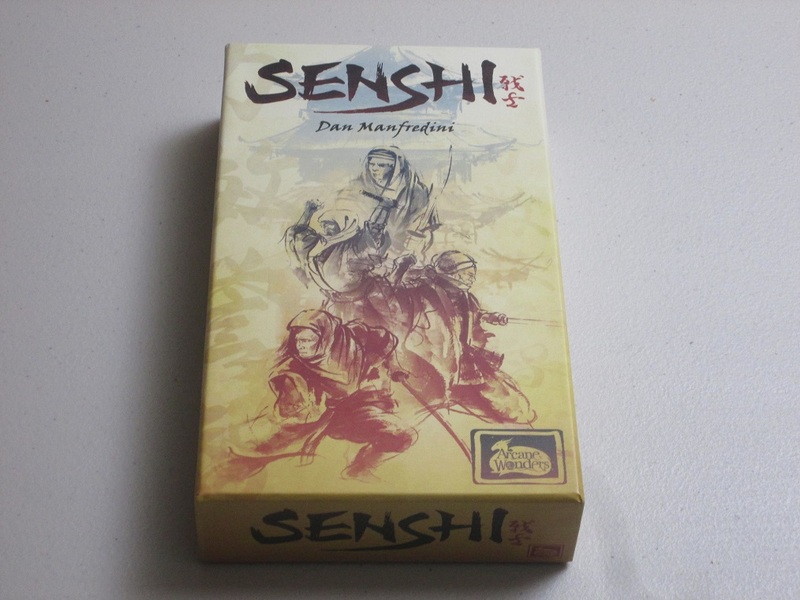 Yet everything about Senshi–playtime, components, choices–is so slight that when you look at that paper from the side, it’s so thin as to become almost invisible. And it’s easy to forget what is invisible. After playing a three-player game at work, my usually opinionated coworkers were quiet, so I coaxed them to tell me what they thought of Senshi. After a pause, one of them said, “It’s like wheat bread. I’ll eat it, and I don’t dislike it, but it’s never what I’d choose.” I’m in the same boat. That’s not to say no one will like Senshi. Microgame enthusiasts might enjoy what’s on offer here, and players who have only short breaks at work might appreciate playing two, three, or five matches in a sitting before they’re back to work. But I’ve said before that not every space at game night or in life needs to be filled, and while Senshi isn’t a game I actively dislike, and I wouldn’t begrudge it if someone else wanted to play it with me, I’d just as soon have downtime instead. 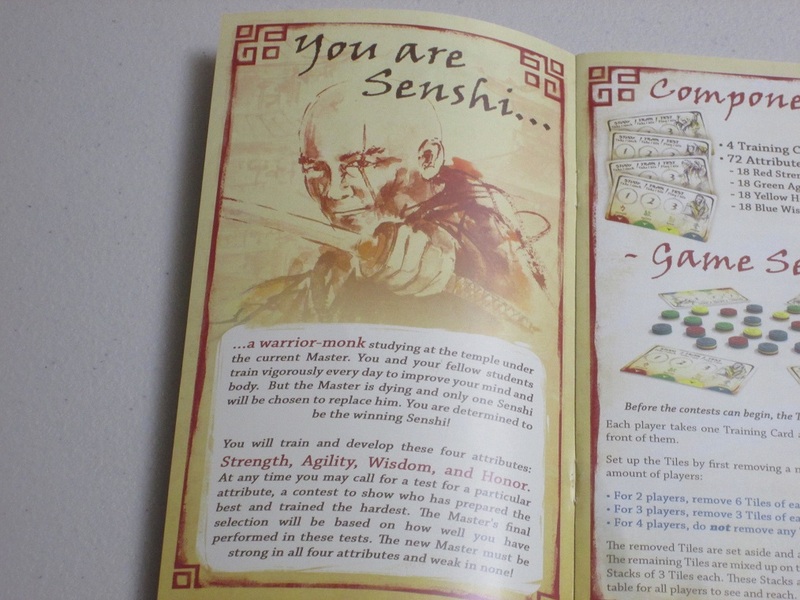 iSlaytheDragon would like to thank Arcane Wonders for providing us with a copy of Senshi for review. Interesting article…I, however, fund this one to be a great little filler game, with enough tension and strategy to keep it light and fun. I would say, like most abstracts, it’s better with more people. By contrast, my girlfriend and I can play Azul, two player, with no issue whatsoever, but I think Senshi shines with more players, especially with four “students” in the game. Thanks for a different perspective! I admit, to me it still seems like there’s no “there” there, but I’m glad it’s finding an audience somewhere.